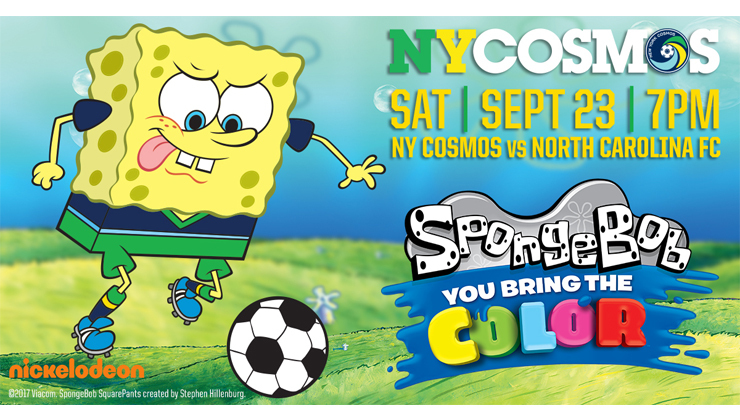 The New York Cosmos and Nickelodeon have partnered to host the SpongeBob SquarePants: You Bring the Color night at MCU Park on Saturday, September 23, when the Cosmos face North Carolina FC at 7:00 pm. 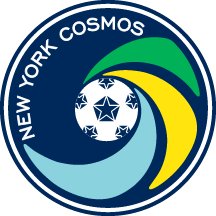 On this day, Cosmos fans will have the opportunity to enjoy appearances from SpongeBob SquarePants and friends, participate in interactive games, enter to win premium giveaways, experience halftime entertainment activities and more. In continuation of the team’s efforts to aid those affected by Hurricane Harvey,Cosmos players will wear customized Inaria-branded Nickelodeon SpongeBob warm-ups. Additional SpongeBob warmups will be autographed by players and raffled off, with 100% of the proceeds going to the Greater Community Foundation of Houston’s Hurricane Harvey Relief Fund. Use promo code “SPONGEBOB” for $10 end line seats. Get your tickets for SpongeBob night here. The first 3,500 fans to enter MCU Park will receive complimentary ‘SpongeBob You Bring the Color’ pins. The team returns to MCU Park for a rematch against Jacksonville Armada FC on Sunday, September 17 at 5:00 pm. Tickets are on sale now. For more information, click here.